“Infinite Variety: Three Centuries of Red and White Quilts” was on exhibit at the Park Avenue Armory in New York City awhile ago, where quilts were displayed hanging from the ceiling. 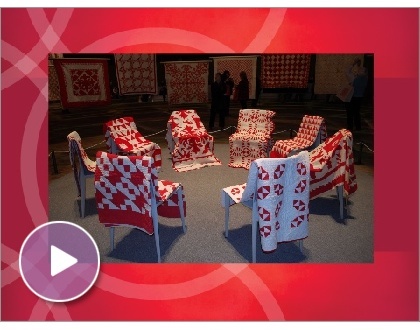 TheQuiltShow looks at quilting and embroidery in the quilts in this Smilebox presentation. A collection of local Amish folk art is on display in the Music Center’s Hershberger Art Gallery to Sepember 16, 2018. The collection will then be remounted in the Harold and Wilma Good Library Gallery from September 23 through November 18, 2018. 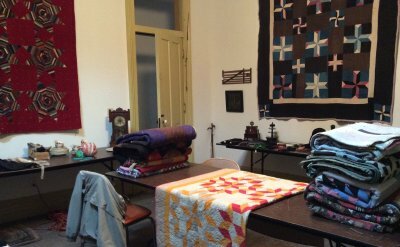 The exhibit presents a wide range of domestic folk arts gathered from Old Order Amish communities in primarily Elkhart and LaGrange counties in north central Indiana. The exhibit includes items such as quilts, comforters, clothing, dolls, rugs, pincushions and sewing caddies, as well as several rare pieces of paint-decorated furniture － a chest of drawers, blanket chest, one-drawer stand － dating from as early as 1871. Thanks to a generous gift, these objects were purchased from the collection of David Pottinger of Goshen, of materials collected beginning in 1977. Other Amish collections from Pottinger are held by the Museum of American Folk Art, Indiana State Museum and Fort Wayne Museum of Art.